Recommended to: Readers, both young and old, who enjoy a silly and adventure driven story with amazing characters! In The Northern Frights, the third book in the spooky Scary School series, Charles “New Kid” Nukid and his friends, including Lattie, a girl ninja, must fight an epic battle with an ice dragon to save their school. But first they must survive going to Scream Academy as exchange students. And that may be hard, because the Academy has an abominable snowman for a principal, a Headless Horseman as one of the teachers, and the students are yetis, trolls, and ogres! Will Charles survive to make an ancient prophecy come to pass and save everyone? 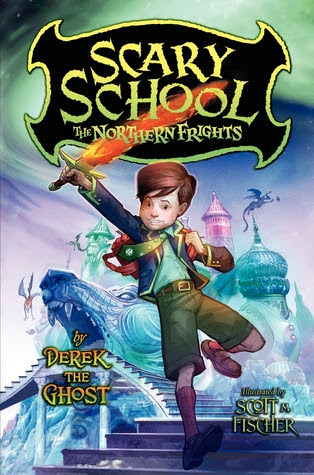 The illustrated Scary School trilogy by Derek the Ghost, with its mix of humor, scares, and adventure, is a perfect pick for middle-grade readers of the Wayside School series and the Zach Files books. Charles Nukid is back, and this time he's in an even bigger mess than before. For someone who is such a stickler for the rules, poor Charles sure does seem to find himself in some pretty crazy situations! In The Northern Frights our favorite students from Scary School are sent off as exchange students to Scream Academy. They've heard that it's even scarier than their own alma mater! Is that even possible? Oh yes, yes it is. I was so excited to meet the new characters in this book. Scream Academy is a huge melting pot of monsters and eager readers will get to meet everything from a yeti to a headless horseman teacher! I won't deny that Lattie, the newest Scary School student, was my favorite addition. A girl with ninja stealth, a heart of gold, and a millipede for a pet? How can you go wrong? I couldn't get enough of her and I really hope to see her back in the next book! The message in The Northern Frights was also one that really spoke to me. I've learned that each one of Derek's books sneaks a life lesson or two. They're there, but cleverly disguised with wit and magic. In this particular book, Charles Nukid and his friends learn that it isn't what's on the outside that counts. You can be brave without being a monster, kind even if you look scary to others who might not know you, and good at something even if you have to do it a bit differently. I loved it. The absolute only reason I rated this installment a bit lower than the previous two is because it is a little more serious, and a bit slower moving overall. I, for one, had a great time following the students as they survived near death experiences and muddled over ancient prophecies. However there weren't as many giggle worthy moments, and I know as a younger reader I'd definitely miss that. Rest assured, I still loved this book! I'm simply letting you know it's a bit different than the first two. So, pardon me while I start a slow clap because I am totally blown away by the Scary School series as a whole! Book three, and I'm still totally enamored with every aspect of this adventure. If you haven't started reading yet, what are you waiting for?